An evening out on the town, dinner at a fancy restaurant, bar hopping with your friends. These are all practical applications for showing up on your bike looking as cool as you feel. The new Alpinestars Brera Airflow Leather Jacket and Oscar Charlie Leather Jacket are perfect for the rider looking for decent protection without sacrificing fashionable styling. 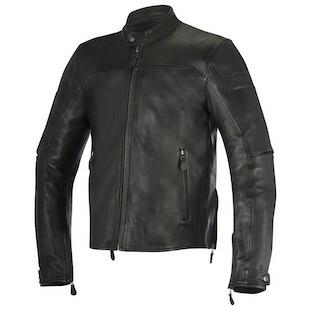 The Alpinestars Brera Leather Jacket would make a great addition to any GQ models riding arsenal. The 1.1mm Calf Skin leather is soft and elegant and the fact that Alpinestars has foregone intense styling in favor of low key embossed logos on the shoulders really allows the jacket to show off it’s beauty. The CE Certified Bio Armor and pre-curved sleeves make the jacket very comfortable in any riding position and gussets at the shoulder, back, and elbow give the user plenty of mobility. The Brera has no problem fending off cool weather, but when the temperature really starts to rise you could opt to select the fully perforated Alpinestars Brera Airflow Jacket. Black and Tobacco Brown are your color options so pick your poison wisely and ride into the night. 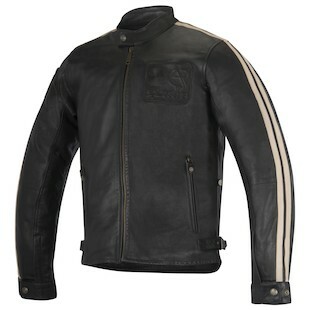 The Alpinestars Charlie Leather Jacket is great for the rider looking for the traditional Cafe Racer styling in the form of a high quality leather jacket. The white race stripes add a flare factor to the full grain 1.0-1.1mm leather used throughout the entire chassis. The interior flannel liner vest adds a nice touch for the cool late night weather, you’ll have no problem staying warm while looking cool. Not for lack of protection, this jacket is more than just a style piece and includes CE Certified Bio Light armor in the shoulder and elbows which is in line with the rest of the Alpinestars Oscar collection of apparel. Functionality is key, the small shoulder gussets and slightly elongated arms make the Charlie Jacket a comfortable leather for all of your riding needs. Throw in an Alpinestars Nucleon Back Protector and you will have a jacket that not only looks great, but keeps you protected. The Alpinestars Brera and Charlie leather jackets are fully functional as a riding jackets and have no problem making the wearer look highly fashionable. The high quality leathers used throughout are soft to the touch, but have no problem warding off abrasion in the case of a fall.